Adware programs seldom get distributed individually. They often enter target computers with the likes of AppendRunner that help adware applications perform their functions. AppendRunner is an adware helper that will get installed on your PC along with the adware application it is associated with. Thus, when you are about to remove some unwanted adware app, you have to make sure you delete AppendRunner from your computer as well, because, if you leave the adware helper alone, it might download and re-install the unwanted and potentially dangerous software. To ensure that you have gotten rid of all the potential threats, do not forget to run a full system scan with a reliable computer security tool. In order to avoid getting infected with adware and AppendRunner, you need to refrain from downloading software from third-party file sharing websites. Although some of the files hosted on such sites might be reliable, websites that distribute freeware and shareware often contain third-party ads that promote unverified content, and clicking such ads may eventually lead to online marketing pages or other websites that are involved in malware distribution. Thus, whether you have AppendRunner on-board or not, safe web browsing should be your utmost priority, especially if you want to avoid malware infections. AppendRunner is very similar to the Microengine adware helper because these applications are used by the Multiplug adware family to increase their functionality. Such adware programs as UniSales, YoutubrAdBlocker, Optishopper, CheapNCheap, and many others depend on AppendRunner and similar adware helpers to display commercial pop-ups and run the most basic processes. What’s more, if you delete the adware program, but leave AppendRunner, it is very likely that the adware helper will connect to the Internet behind your back and download the program again. Our research shows that AppendRunner can restore adware program information in your system settings, registry keys, and even program files. The application can re-install almost all adware programs that are distributed via the InstallRex installers. For example, if you click a random uninstaller called DemiUpgrader, FalconCentre, GrubTartan, Statengine, and so on, you would only initiate a repeated download and installation of a particular adware program that utilizes AppendRunner to achieve its aims. Therefore, if you want to keep your computer safe (and this is exactly what you should be aiming for), you need to remove AppendRunner from the system right now, terminating all the related programs as well. We provide manual a removal guide below this description, but, if you encounter any difficulties while removing adware from your computer, you can always leave us a comment below this description. Keep in mind that your best shot in protecting your PC from harm would be acquiring a licensed antispyware application. Highlight AppendRunner and click Uninstall. Click Uninstall a program and remove AppendRunner. 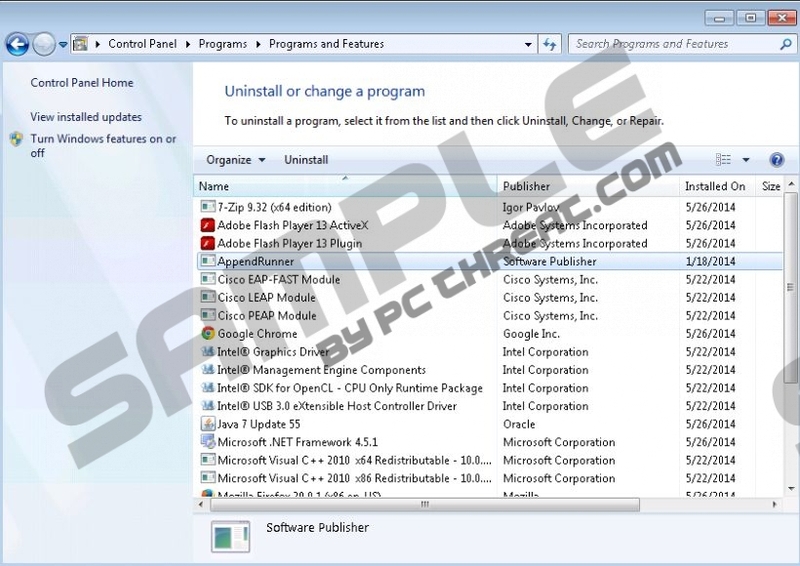 Select Add or remove programs and uninstall AppendRunner. Quick & tested solution for AppendRunner removal.